If you would like to subscribe, have a question, comment or suggestion for our permitting staff or about this newsletter, please click on the drop-down form above. Florida residents enjoy many rewards from functional stormwater management systems, especially well-maintained systems. Some of the many benefits include enhanced curb appeal, the creation of urban and suburban aquatic ecosystems, the removal of stormwater runoff-borne pollutants, and flood protection. If properly maintained, stormwater systems (ponds, swales, underdrains, exfiltration and stormwater structures, including inlets and discharge structures) help prevent flooding and filter out pollutants before they reach streams, rivers, lakes, wetlands, groundwater, estuaries/lagoons and, ultimately, the ocean. Very often, the problems associated with a lack of stormwater system maintenance are not evident until a significant rain event occurs and exposes problems in the system. Even the everyday rain events that Florida experiences in the spring and summer months can reveal issues created by deferred stormwater maintenance. Make sure that flow paths to and from ponds are clear of debris. Now is the time to undertake the necessary maintenance to keep your stormwater system functioning properly. Property owners can contact their homeowner’s association to reach out to the district for assistance. Upon request, the district can aid associations in fully understanding the flood protection function of their ponds and help craft an effective pond maintenance program to ensure maximum drainage performance and property protection during storms. Did you know that stormwater can also be used to augment a reclaimed water system, help resolve a flooding issue, or assist in the prevention or recovery of an MFL (Minimum Flows and Levels) waterbody? The St. Johns River Water Management District is responsible for protecting natural resources and supporting Florida’s growth by ensuring the sustainable use of Florida’s water. The average annual rainfall within our district is 51 inches per year. With this amount of rainfall, the use of stormwater runoff can be expanded to benefit water supply and water resource development projects. Stormwater harvesting refers to the collection and beneficial use of stormwater runoff. 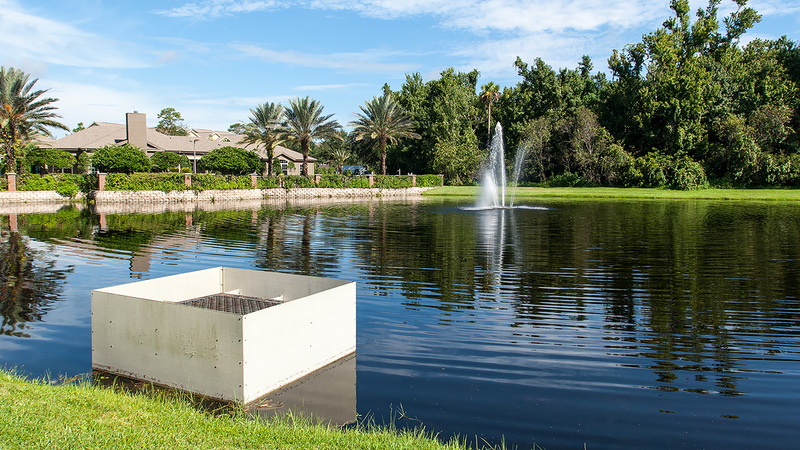 The most common form of stormwater harvesting involves withdrawing water from a stormwater pond and using it to irrigate the surrounding turf grass and landscaped areas. 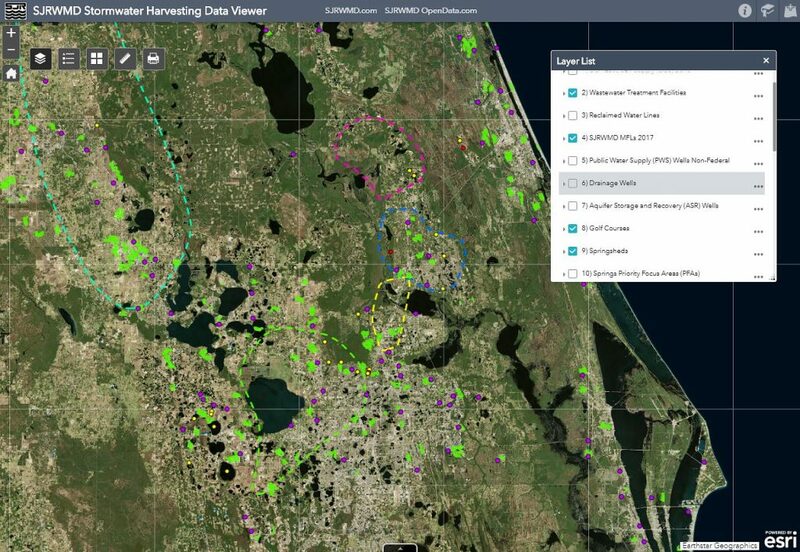 The district collaborated with the Florida Department of Transportation (FDOT) and the Florida Department of Environmental Protection (DEP) to develop an online Stormwater Harvesting Data Viewer. The data viewer is a visual and spatial tool that can be used for planning and project development. The tool can help identify areas where stormwater harvesting can be beneficial, pair alternative water supply with demand, build partnerships through regional projects and match stakeholders’ needs. When stakeholders are involved early in project development, they can form partnerships, combine infrastructure and possibly reduce costs on projects that benefit all parties and align with the district’s core missions. A water reclamation facility can benefit from stormwater augmentation, especially if the utility currently supplements their system with high quality groundwater commonly used for public consumption. Other infrastructure, such as rapid infiltration basins, may be available for aquifer recharge with stormwater. MFLs are the minimum flows and levels of a waterbody that need to occur to prevent significant harm to the resource. Some springs are projected to fall below their established MFL or are currently not meeting their established MFL. A stormwater harvesting project could offset nearby groundwater withdrawals and aid in a spring’s prevention or recovery strategy. This layer identifies the springshed boundaries for DeLeon, Gemini, Silver, Volusia Blue and Wekiwa-Rock Springs, among others. A stormwater harvesting project within a springshed can offset groundwater withdrawals and/or minimize harm to surrounding wetlands and other waterbodies. Golf courses are generally high-water users. There may be an opportunity for an upcoming project to partner with a golf course and divert stormwater for irrigation. Such partnerships may reduce the footprint of a pond or reduce the land acquisition funding needs for a pond. This layer shows upcoming FDOT road projects in early phases of planning or project development, which may include the construction of stormwater ponds. These projects are potential stormwater sources, which can benefit a nearby water user such as a utility or a golf course. These utilities augment or have an allocation to supplement their reclaimed water system with groundwater, surface water and/or potable water. There is a potential opportunity to partner with a utility that needs additional water. Augmentation with stormwater can reduce a utility’s groundwater withdrawals and benefit nearby water resources. These are areas where Basin Management Action Plans (BMAPs) or restoration plans have been adopted. Several of these plans were adopted to address waterbodies that have a nutrient-related impairment. A stormwater harvesting system can provide a high pollutant removal efficiency, which may be required if the project is located in a BMAP area. There is potential to harvest stormwater from flood prone areas or closed basins and use it beneficially for aquifer recharge, wetland hydration or reclaimed water augmentation. Further, this flood prone entity may partner with an upcoming project to design a regional stormwater facility that provides both water quality treatment and alleviates flooding. * Contact DEP for permit requirements involving stormwater augmentation at a reclamation facility. When planning for site development near the beach, west of the State Coastal Construction Control Line (CCCL), it is important to consider lighting effects on nesting sea turtles in addition to addressing the wetlands onsite. Sea turtles are federally listed as threatened or endangered and are protected under the federal Endangered Species Act of 1973 and Florida’s Marine Turtle Protection Act (379.2431, Florida Statutes). In addition to review by the St. Johns River Water Management District, applications for development projects located near beaches that may affect sea turtles should be reviewed by the Florida Fish and Wildlife Conservation Commission (FWC). There are five species of sea turtles that nest on Florida beaches: loggerhead, green, leatherback, Kemp’s ridley and olive ridley. Nesting season occurs from April through October every year. Lights from businesses, residences, street lights and other development discourage females from nesting. FWC has developed a model lighting ordinance for marine turtle protection (62B-55, F.A.C). Generally, FWC recommends that applicants develop an exterior lighting plan consistent with FWC’s sea turtle lighting guidelines. Acceptable fixtures and lamps can be found in the FWC-approved Sea Turtle Lighting guidelines and FWC-certified Wildlife Friendly Lighting fixtures, which can be accessed through the FWC website at http://myfwc.com/conservation/you-conserve/lighting/certified/. When reviewing a project west of the CCCL, it is helpful to contact FWC early, review local sea turtle ordinances and be familiar with site-specific information to determine whether impacts to the nearby sea turtle nesting beaches are minimized. If a project is proposed near beaches and has been identified by FWC as having possible lighting issues, reviewing the local municipality sea turtle lighting ordinances can aid in compliance with the FWC recommendations. In some cases, exterior lighting plans are required by FWC to minimize the effects on the nesting beaches. In other cases, determination of acceptable lighting will require using reasonable scientific judgment based on the location of the proposed project, existing lighting in the area, surrounding buildings, and the proposed lighting plan. Meeting information is posted as meetings are scheduled. Check back here or on our meetings and announcements page for details. Wells fail, and when they do, drilling a replacement well may become an urgent situation. A pre-application discussion with district regulatory staff will help expedite the consumptive use permit (CUP) permitting process for the well replacement. A pre-application meeting provides an opportunity to let regulatory staff know that an expedited request is being submitted and to discuss the information needed to obtain the permit modification for the replacement well. The pre-application meeting and letter requesting a permit modification may be completed by the well owner or their agent (consultant, water well contractor, etc. ), as long as an authorized agent letter is provided along with the letter modification request. If you need assistance, agricultural entities should contact Ag Assistance Team member David McInnes at 386-227-0126 and all other CUP well types should call your nearest service center and ask to speak with a CUP hydrologist. What is the Mitigation Bank Search Tool? If you’d like to learn more about mitigation banks permitted by the St. Johns River Water Management District, the district’s website contains a Mitigation Bank Search Tool that allows you to view information about mitigation banks. The webpage includes a mapping interface with various data layers, a frequently asked questions page, a link to the file which contains the permit, technical staff report, final approved plans, a detailed credit ledger, the type and availability of credit, the mitigation bank service area, the basin the mitigation bank is located in, contact information for each mitigation bank and much more. For any questions or suggestions about the Mitigation Bank Search Tool or the Mitigation Banking Program, please contact Reid Hilliard, Technical Program Coordinator, at the district’s Maitland Service Center, 601 South Lake Destiny Road, Suite 200, Maitland, FL 32751; 407-659-4873 or jhilliard@sjrwmd.com. What is the Annual Statement of Continuing Use Form? Consumptive use permittees are required to maintain records of water quantity usage on a monthly basis for the life of the permit and provide those records to the district when requested. However, a consumptive use permit (CUP) holder whose total combined allocation is equal to or less than 100,000 gallons per day, on average, has a simplified way to confirm that they still use water in accordance with their permit. This is done by submitting the Annual Statement of Continuing Use form in lieu of submitting the EN-50 Water Use/Pumpage Report form. Do you still own, lease or control the property on which the permitted withdrawal point(s) is located? Did you use water for the purposes identified in the authorization statement (of the permit) during the past calendar year? For assistance in submitting your Annual Statement of Continuing Use form via the e-Permitting portal, call 386-329-4570 or send an email to epermit@sjrwmd.com.